Home >Forums > Sports > Cain Velesquez: New Heavyweight Champion! Cain Velesquez: New Heavyweight Champion! Junior dos Santos seemed invincible in his heavyweight rein but Cain Velasquez put a devastating beating on Santos that shocked the world. Dana White confirmed this was the most one-sided dominating Title fight ever. It went 5 rounds with Cain just breaking his will each round. Cain Velasquez is once again the baddest man on the planet. A one man wrecking machine. I know the Bilderberg group is behind this all. 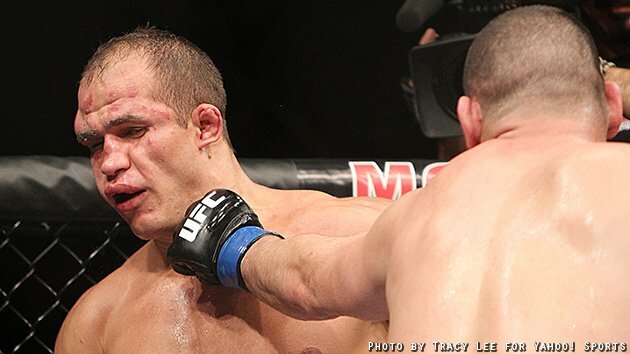 JDS spoke out against the secret world government, thus forcing Bilderberg to conspire with the UFC to get Cain to pummel JDS, silencing him and stripping him of the championship. What do you say Geo, lets investigate this! We'll get Alex Jones to lead our journey, Infowars to report all our findings, and get Ron Paul to lose another primary. We'll expose them all. Oh yea, Illuminati. I felt I had to mention them at least once. The UFC is conspiracy free. UFC commentator Joe Rogan is long time friend of Alex Jones and occassional guest on the show.